Jacques Brel. Per­haps his name needs no intro­duc­tion, no elab­o­ra­tion. He was a leg­end; a com­poser and a singer of tal­ent and charisma who took his audi­ences to worlds of pain and joy. His genius was cap­tur­ing the full­ness of life, whether ten­der or sav­age. Every musi­cian lives in the shadow of his legacy. 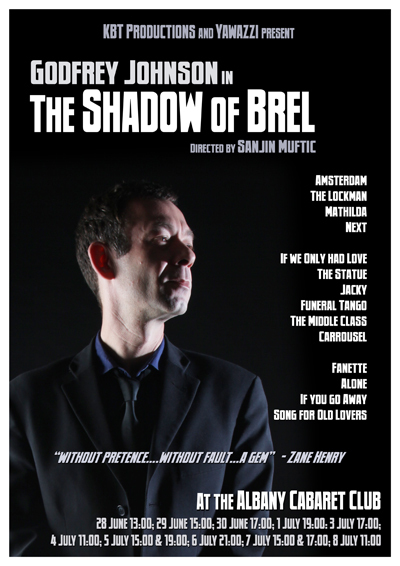 The Shadow of Brel is God­frey Johnson’s acclaimed solo show of the master’s great­est works. It has been performed at Tabula Rasa, Kalk Bay Theatre, The Rhumbelow, the Theatre on the Square, and at the National Arts Festival. Godfrey Johnson’s performance has driven audiences to their feet at every venue. Your next opportunity to hear Godfrey play some of the most moving chansons ever written is at Alexander Upstairs, Friday the 2nd and Saturday the 3rd of November. To hear some of Godfrey’s interpretations please visit his Soundcloud profile.